The Linen Closet, LLC specializes in chair covers, table linens and decorative table chargers for wedding receptions, banquets or any special occasion. All of our linens are made of high quality materials and come in a variety of colors. Each chair cover is hand washed, inspected and pressed prior to your event. With our elegant chair covers and table linens we can transform your special occasion from simple to elegant. 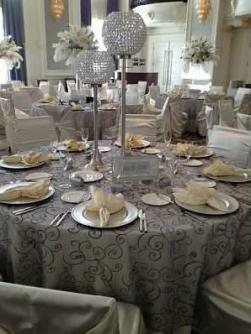 Our wedding chair covers and linens will create an elegant ambiance that everyone will remember for years to come. It is your special day and your style, let The Linen Closet take care of your linens and make it truly an unforgettable day! © 2007-2015 The Linen Closet, LLC. All Rights Reserved. Click This Link to Read Customer Reviews about us on WeddingWire!! !